The GRD Galaxy Roof Mounting, Direct Driven, Twin fan range represents the latest development from Vent-Axia in high performance, run and standby twin fans. Designed to be controlled inconjunction with Vent-Axia Trakmaster twin fan controller range, the total package offers the end user flexibility when interfaced with or without a (BMS) Building Management Systems, such as: manual selection; 12/24hr auto changeover ensuring the extended life of the fan and motor; night setback during low levels of occupancy for energy management control during 24hr extraction. The unit casing is manufactured from mill finished aluminium fitted with a discharge aluminium weather Louvre with bird mesh as standard, ensuring suitability for exposed external environments. Assembly is controlled to BS EN ISO 9001. Optional acoustic lined casing is available. 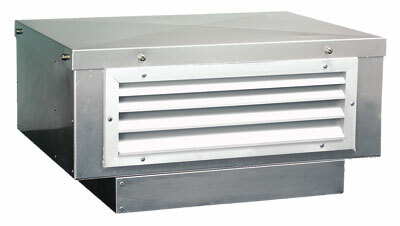 Individual gravity return shutters are fitted as standard to prevent air recirculation through the standby fan or the system during shut down periods. The Galaxy Roof Twin Fans are suitable for horizontal mounting. When installed on a shallow pitch roof (max 20°) a special upstand will be needed to compensate for the angular difference – manufactured by others. To meet COSHH requirements, double pole service isolator switches are fitted and pre-wired to the fans and mounted to the outer casing to reduce installation time and cost. Access to the fan section is via an easily removed top access panel for cleaning and maintenance during shut down periods. The Galaxy range has ten models with extract performance ranging from 0.056m³/s up to 1.339m³/s (201m³/h to 4820m³/h), with pressure characteristics of up 400Pa. All models are supplied with inlet spigots on the underside of the unit casing and a HET9TF discharge anodised aluminium weather louvre. Galaxy features motors and DIDW forward curved centrifugal impeller assembly specifically chosen for performance. The assembly is dynamically balanced to ISO 1940 Grade G.6.3. Ball bearings are greased for life. Insulation is Class ‘B’ (from –15°C to + 40°C). All Motors are single phase 220-240V 50 Hz. The isolator is supplied with all models with PG11 entry protected against dust and water jets from any angle for external use. All motors are fitted with Standard Thermal Overload Protection (S.T.O.P.) motor protection by means of a thermal contact switch incorporated in the windings to prevent motor damage by overloading/overheating. GRD fan performance is tested in accordance with Test BS 848 Part 1. Sound levels are measured in a reverberant chamber in accordance with BS 848 Part 2. Published dB(A) figures are free field sound pressure levels at 3m with spherical propagation at a reference level of 2 x 10–5Pa (20 micro-Pascal). The inlet and outlet sound power level spectra figures are dB with a reference of 10–12 Watts (1 pico-watt). To ensure minimum noise levels during speed control, an auto transformer speed control is recommended. Design and manufacture are in accordance with the standard for quality management system BS EN ISO 9001. The ITC model provides automatic changeover on fan failure as well as enabling a manual selection of either fan for duty sharing or test purposes. (BMS compatible via volt free contacts). This controller must have a permanent live supply. Any On/Off switching must be via the sensor connections S1 and SG terminals. Wired in conjunction with either an ITC or ITC-DS controller the RVC can be located up to 100m away using low cost ELV wiring. The compact, single gang RVC ELV (Extra Low Voltage) remote visual controller indicates status of Fan 1 and Fan 2 with status/warning lights. Push button allows Fan 1 and Fan 2 with standby (Off) to be selected.